Last week, after a late night at the office, I found myself scrambling to get to the supermarket on time to grab a rotisserie chicken. At one of the grocery stores I shop at, if you get there after 8pm chances are you’ll find the chickens no one wanted – if you are lucky. Burnt wings, torn skin, just sad looking chickens that have been sitting around for a while. 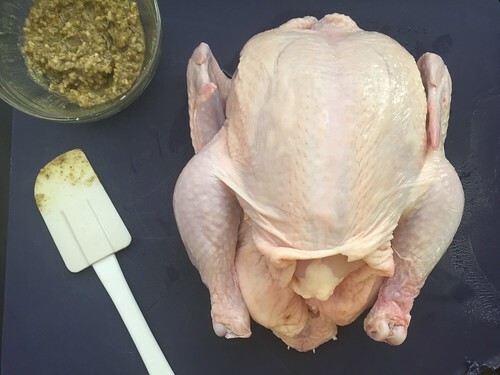 Although everyone needs a good standby place to go grab one, many publications and renowned chefs agree that learning to roast a chicken is an essential kitchen skill. The basic seasoning for Puerto Rican roast chicken includes salt, pepper, fresh garlic and dried oregano. I like adding a small amount of cumin to the mix as well. 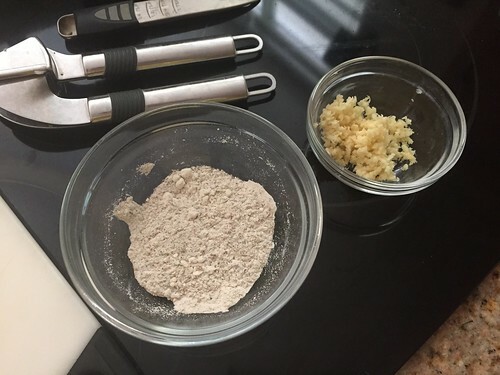 I like to blend all the dry ingredients into an uniform adobo using a spice grinder, but you can mix them with a whisk and it will work just as well. After the dry ingredients are well combined, fold in the garlic and the olive oil. That’s your adobo! One trick I picked up from my favorite rotisserie place near my former workplace was stuffing the cavity with a bay leaf. It subtly flavors the chicken from the inside as it roasts. The seasoned chicken rests overnight or for at least four hours in the refrigerator. Leave the chicken uncovered so the skin dries out. The drier the skin, the crispier it will come out of the oven. You may also cover it loosely with plastic wrap if you don’t want the chicken to be too exposed in the refrigerator. 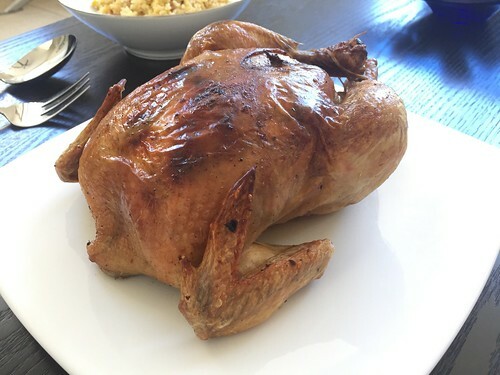 To get the right color and crispy skin, the whole chicken needs to rest in a flat surface. Broiling pans are perfect because the chicken is exposed almost completely to the heat. The drippings that are caught in the bottom pan are perfect to spoon over the finished dish or to start a gravy. 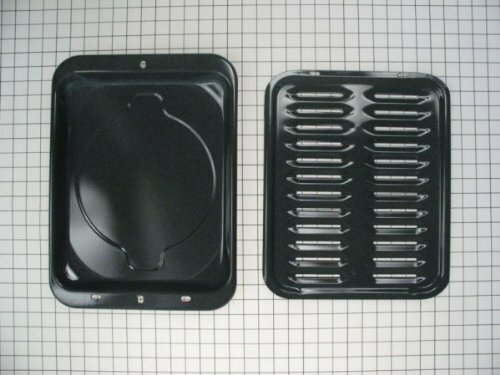 Basic roasting pan kit that comes with your oven. Click on the picture if you need a replacement! If your oven has a convection or “ROAST” setting in addition to “BAKE”, use that for cooking the chicken. While the “BAKE” setting applies heat evenly from the top and bottom, using “ROAST” shifts the heat so it cooks the top part of the chicken more intensely. Additionally, it activates the oven’s fan, which distributes the heat and allows the chicken to cook and brown evenly. Proportions for creating the adobo or seasoning blend for one pound of rotisserie chicken. Remember to multiply these ingredients by the total weight of your chicken. Combine all the dry ingredients in a spice grinder or whisk them together in a small bowl. Mix in the garlic and the olive oil to form a paste. Remember to multiply the ingredients shown by the total weight of the chicken. Carefully separate the chicken meat from the skin. Rub the seasoning on all the chicken meat, making sure to cover the legs and thighs as well as the breast. Use any leftover adobo on the chicken skin. Place the chicken uncovered in the refrigerator for at least 4 hours or overnight. You may cover it loosely with plastic wrap. Remove the chicken from the refrigerator 30 minutes prior to roasting so it comes to room temperature. Preheat the oven in the "ROAST" setting at 350˚F. Transfer the chicken to the broiling pan. Tuck the wings underneath the breast and tie the legs together with kitchen twine. 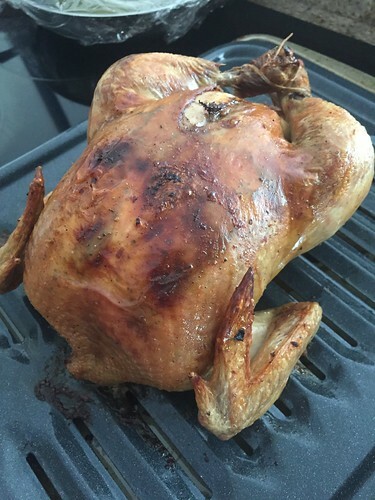 Roast the chicken for 35 minutes and rotate the pan. Continue roasting for another 35 minutes or until the internal temperature registers 165˚F. Let the chicken rest from 10 to 15 minutes before carving. Sounds great and will definitely try it however, looking for recipe that stuffs Chicago with black beans and rice. Had it multiple times in San Juan but cannot find recipe. Anyone have one? Try searching for congri stuffed Cornish hens.